When I click on the movie it "load" into it, PS4 just stays at a black screen? I've tried this with DVD's movies and freeze my ps4 right after clicking on them. Is this a firmware issue? Like with the 1.50 update or could this be hardware? - How do I fix the problem on my ps4 . It says "unrecognized disc " when i put in a game. Any suggestions ? * Try to eject the stuck disc manually, clean it and reboot your PS4. * Someone suggested to turn off the PS4 internet connection and the movies will play. * Someone gives the direction of updating your PS4 to the newest version 1.52 and then try again. * Pull out the hdmi cord and plugging it back in when the screen stays black. * Rip DVD movie to PS4 supported video format using a PS4 DVD ripper for effortless DVD playback without inserting disc anymore. Maybe do some audio video setting could be on the cards to make playing DVDs easier on the Sony's new game console after adopting the above methods. But based on my own experiment, I directly have a shot on the last solution - rip DVD and play DVD movie on PS4 with friendly video format. It worked! And I have to say it is the best way to liberate myself from endless annoying predicament. If you are the one similar to me and want to dig out the easiest yet most efficient solution to play disc movies on PS4 without any trouble, here you come to the right place. This article shares a dead easy solution to get DVD PS4 problem worked out with the help of a professional DVD ripper called MacX DVD Ripper Pro. MacX DVD Ripper is a professional DVD to PS4 ripping program that lets you 1:1 copy and rip protected DVD/homemade DVDs to MOV, MP4, FLV, AVI, MPEG4, H264, WMV, etc with original quality and fast speed. About 300+ preset profiles available for Apple, Android, Sony, Microsoft and Google devices make DVD playback pretty easier than ever. Therefore, you can directly rip DVD to PS4, PS3, Xbox One, iPhone XS/XR/X/8/7/6s/SE/6s Plus, iPad Air 2/mini 4, iPad Pro, Samsung Galaxy, HTC, Kindle Fire HD, as well as other new phones and tablets. Free download and run this trust-worthy DVD to PS4 ripper on your Mac, import the DVD movie you'd like to rip by clicking "DVD Disc" button . Or simply load DVD folder and ISO image by clicking the relative button on the main interface. You can also get its windows version to tackle the PS4 won't play DVd' problem. From the pop-up small window, you can choose "Sony Device" --> "to PS4 Video" and choose PS4 H.264 or MPEG4 as the output video format. Click the "Done" to return to the main interface. Tips: the stunning "Edit" feature lets you crop the video size to better suit your PS4's screen, trim the video segment, add watermark and external subtitle as you want. It's the same to rip DVD to PSP MP4, Galaxy Note etc. and othe Android devices. With the above steps been finished, click the "RUN" button to start DVD to PS4 conversion on your computer. If you want to import DVD to iPhone iPad etc. iOS devices, sync the ripped movie file with iTunes alternative, MacX MediaTrans for faster and easier transferring speed. When the DVD to PSP MP4 ripping finished, you can freely transfer DVD movie to PS4 and watch movie on PS4 anytime and anywhere you like, without being bothered by asking yourself the questions like "Why my PS4 won't play DVD?" or the like. This article is about how to rip DVD to Xbox supported formats MPEG4, H.264, AVI, etc. With the Xbox DVD ripper, you can easily convert movies from DVD and save them to the internal hard drive of Xbox console. This tutorial is about how to rip DVD to Galaxy Note 8 supported formats. With the help of MacX DVD to Galaxy Note 8 ripper, you can easily put and play DVD movies on Samsung Galaxy Note 8 wherever you go. 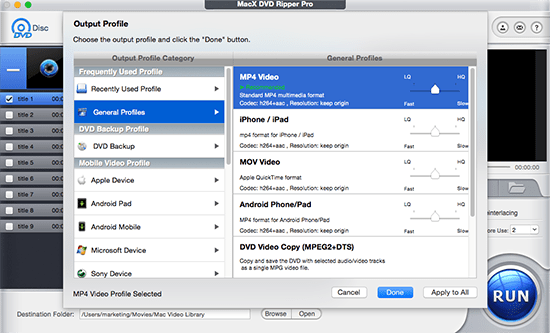 MacX DVD Ripper Pro is the best DVD to PS4 ripper for Mac which can freely rip DVD to MP4 AVI WMV PS4 supported formats or iPad Pro/Air 2/mini 4 and backup any DVD disc, ISO image, DVD folder on Mac (MacBook Air/Pro, iMac etc) in 1:1 quality with original quality.